He was born in Buffalo, NY. James Madison Parker is a tall, handsome African American gentleman born in Buffalo, in 1925, just prior to the Great Depression. His father died while he was a child, and typical of many "depression kids" Jimmy found it necessary to leave school for work after eighth grade to help support the family. He remarked, "I had to go to work; at times I was the sole support of my mom, sisters and brother. My Mother found it quite a struggle to care for five children on a domestic's wages, but back in those days, that was all she could find as a black woman without education. Those were tough times and everybody in the family did their share to keep us in shoes, shelter, and clothing." Jimmy attended a local elementary school, and in 1943 at age 18, was drafted into the United States Navy. Segregation was the order of the day, he said "and at that time blacks were typically utilized as stewards, to wait on the naval officers." Then he added with a derisive laugh, "They tried to scam us by saying if we took our basic training in Bainbridge, Maryland, it would be closer to home, as opposed to the Great Lakes Training base in Illinois. But we (there were five of us) didn't want any part of that, so we chose Great Lakes. We knew what they were trying to do. We might have been young, but we weren't dumb!" Early assignments took him to Yorktown, VA., a depot for storing mines, then to Williamsburg, Va., and a stint at construction with the Sea Bees. This assignment also included work in the storage of deactivated ordinance (mines, etc). 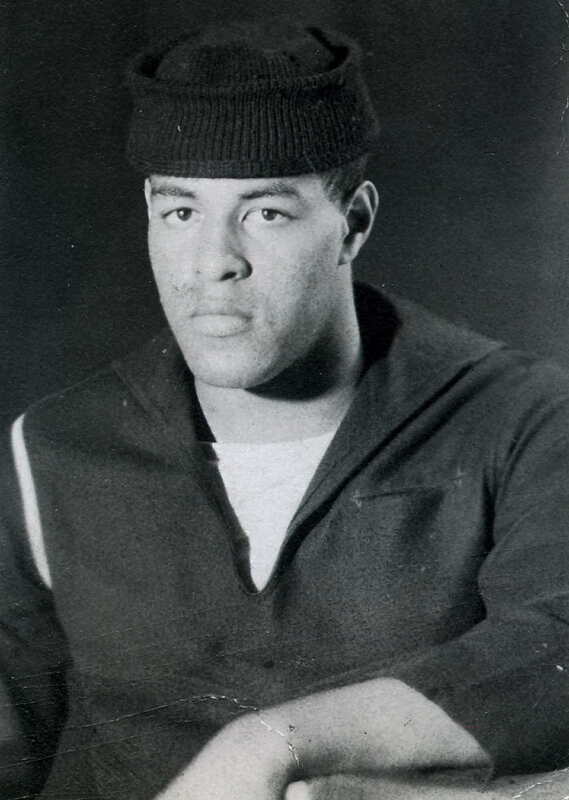 Shortly thereafter, he sailed to the Orient on a destroyer tender, spending eighteen months in Sing Tau, on the coast of mainland China where his plumbing and welding skills in in a naval repair shop earned him the rank of Ship Fitter 3rd Class. The experience gained there, he said "proved to be invaluable during later years when I married and purchased my own home." Jimmy recalls that the mantle of segregation reared its' dark head in Honolulu, Hawaii, as he sailed home from his tour of duty in China. "While our ship was docked, it somehow caught fire, forcing us to remain until repairs were complete and we could continue under our own steam. And it wasn't very long before we found out that Honolulu was more segregated than anyplace in the United States." He shook his head as he recalled the hurtful incidents of the two-week stay there saying, "I'd rather be deep in Mississippi than in Hawaii. At least I knew what to expect in the South. It was such a surprise, and a darned unpleasant one!" Jimmy was discharged in 1950, and joined the Naval Reserves, but was called back just seven months later with the start of the Korean War. This 16-month assignment took him to Guam where his work continued in maintenance/repair on ships that steamed in from battle for rehabilitation and restoration, before sailing out again to the latest skirmish. Little known outside his immediate family and close friends is the story of the baseball field named in his honor while in Guam. When questioned about the circumstances, he professes a lack of knowledge about the affair saying, " I never really found out the reason." But he will reluctantly admit that he played baseball, basketball and football during every assignment in the navy. It is an understatement to say that Jimmy loves sports. Count on him to avidly follow his favorite teams throughout the season, and it's hard to catch him at home during playoffs for any of his favorites. He travels far and near to see those games. Finally the war was over and Jimmy returned home finding work at the Republic Steel Company, retiring when the steel boom went bust and the company closed. He married Bertha Watts, a longtime friend and neighborhood girl whose family lived on the same east side street as the Parkers. Two girls, Carol and Alicia were born to this union that lasted 49 years. Bertha Parker died in April 2000, but family and friends did not worry much about his physical welfare since he'd learned to cook as a youngster, and coming from a large family, knew how to clean house and garden. Following his wife's death, James Madison Parker paused, took a deep breath, grieved in his own quiet way and began a new life. Jimmy is grandfather to two, and uncle to many. He is the family caretaker, sending cards for special occasions and flowers to the old ladies. He calls on the sick and makes a special effort to keep in touch with what the kids are doing. Jimmy assumed the role of surrogate father for his grandson, Amin, after his parents divorced, providing emotional and financial support throughout the years. He is the family "worrywart," always careful of the feelings of others. Friendly yet occasionally shy, he will sometimes remark, "I'm not always comfortable around people." He is an avid reader of newspapers, magazine and books (he loves mystery novels) and follows current affairs on TV and radio. After retirement, Jimmy accepted part-time work in the maintenance department of Canisius College, and "retired" again in 2003. He remains active by exercising, and being the man-about- town with his significant other at concerts, movies, the casino and the theater. He also travels frequently to Providence, Rhode Island for visits with his youngest daughter, Alicia. who is married to the former assistant basketball coach of Canisius College. While the couple lived in the area, Jimmy was thrilled to attend all Buffalo games, and accompanied the team to Paris, France and Spain. When approached to determine his interest in being interviewed for The Veterans Project, Jimmy smiled that shy grin, peering under those eyebrows, and said, "Sure, no one ever asked before this. I'd be glad to."